Stirling—who was also Moe to some and grandpa to others—liked a good meal. His end of the table was always quiet at Christmas dinner as he settled into a heaping plateful of food that included the turkey neck that had been cooked just for him. I used to take great delight in sneaking him extra helpings of trifle for dessert. Yes, Stirling liked the simple things in life. 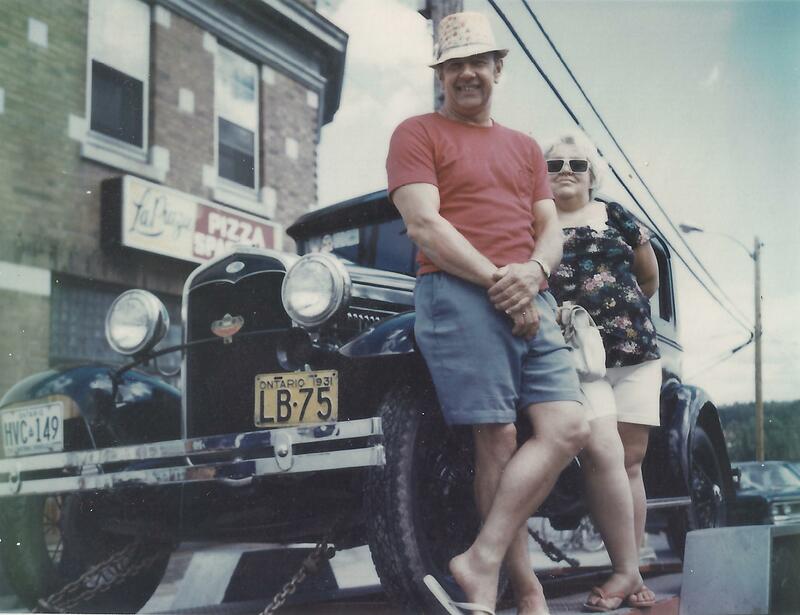 He enjoyed a good piece of pie, singing songs around the player piano, flea markets and car club events. He wore the same red plaid jacket to every dress-up function for 40 years. He went to Florida in the winters for quite a few years—always to the same spot—and once his wife Pearl won a trip and they went on a cruise, but he didn’t travel all that much. 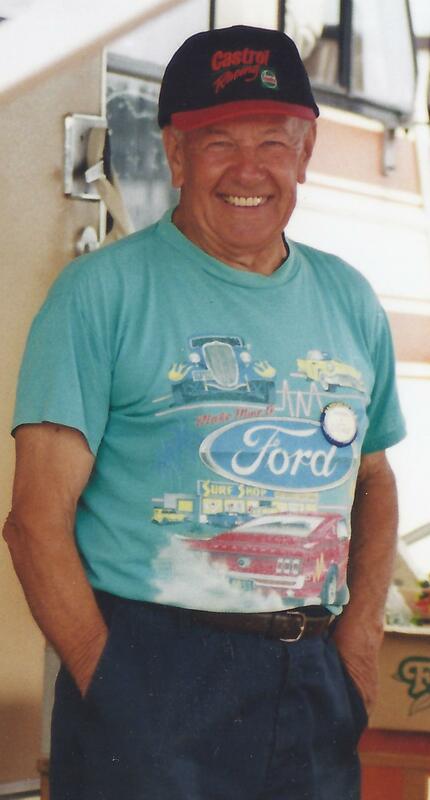 He was content to stay home with his daily routine of oatmeal for breakfast and a nap in the afternoon, to host the annual family corn roast, and to work on endless cars out in the shop. As simple as his life was, however, it was never short of laughter. Stirling loved a good laugh and took great delight in taking me aside and telling me—the minister!—his newest dirty joke. 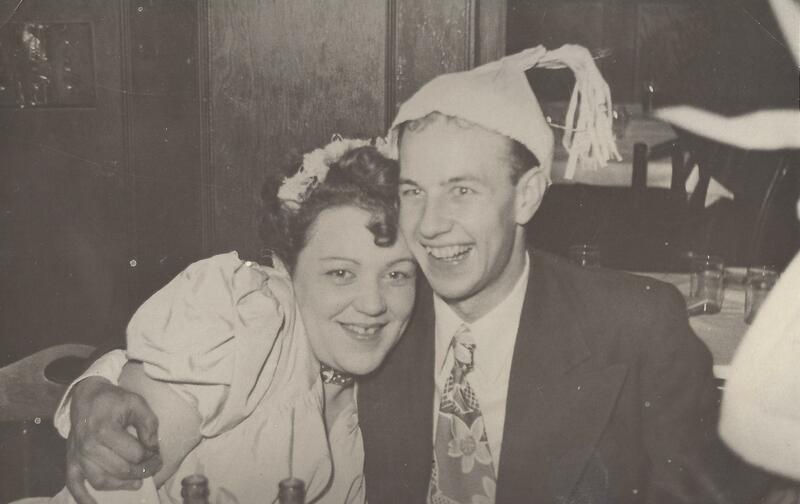 He delighted in conversation with just about anyone—the guy at the gas station, the lady at the lunch counter at Zellers, the people he sat with when he and Pearl went out to play cards. He made friends everywhere he went. Stirling may not have been on fancy vacations or made millions of dollars, but he knew something important about life: it’s not so much what you have or where you go, it’s who you’re with that makes a difference. I thought about that alot today, especially as we gathered to say goodbye. There were so many friends and family that the funeral was standing-room only. There were so many people to serve as pall bearers that there was an entire dozen of them–six at the funeral home and six at the graveside. There were even people who brought their antique cars from hither and yon to form a procession to the cemetery. Stirling’s send off was a testament to the way he lived his life–it was full to the brim with the love of many people. For any of us caught up in the daily hustle of trying to get ahead, Stirling’s life–and death–offer a beautiful piece of wisdom. In the end, who really cares how big your house was or whether or not you got promoted? Far more important is a life of simple contentment, and a myriad of people to love. Yes, Stirling will be missed. But what a great legacy to leave behind. This entry was posted in Uncategorized and tagged family, friends, grief, life, memories. Bookmark the permalink. As I read this almost 2 yrs later Kristine, I think about my Dad’s send off too. Thank you for making a difference by a part of it and his life. I still miss him so very much. Yes, it’s hard to believe that was almost 2 years ago! I have such fond memories of him.